The goal of the project is to assess and compare 1st and 2nd year (and beyond) yield performance in six popular hop cultivars (Cascade, Centennial, Columbus, Galena, Northern Brewer, and Willamette) in replicated field experiments at three elevations in Ohio. The three hop farms involved in the project are located in Southeastern (Hop ‘n’ Pepper Farms, LLC, Athens, OH, 39.3292° N 82.1014° W, Elev. 723´), West Central (Heartland Hops, Fort Recovery, OH, 40.4128° N 84.7764° W, Elev. 942´) and Northeastern Ohio (Hop Focus, Orwell, OH, 41.5350° N 80.8683° W, Elev. 896´), therefore covering the 3 major latitudes across the state and all three farms. While we had anticipated having a harvest in the Fall of 2015, the unusual amount of rainfall that we experienced from March through May and into June prohibited our ability to get into the fields to put up our trellis systems. More importantly, the heavy moisture content kept all three farms from getting our rhizomes in the ground until mid-June, any earlier and we would have risked losing them all. Due to the lack of 2015 data, we will continue to make crop comparisons during the 2016 and 2017 harvest seasons. On May 11, 2015 all three farms received our soil reports a month before planting: soil test results. As stated earlier, due to the heavy rains throughout May and into June, the Cascade, Centennial, Columbus, Galena, Northern Brewer, and Willamette rhizomes could not be safely planted until mid-June. Due to the late planting, all 6 cultivars at the three test yards reached heights ranging from 6 to 8 feet, had healthy leaf structure and strong bines with no signs of mildew or insect infestation. Unfortunately, none of the cultivars produced enough cones to receive reliable yields (wet pound per plant) or quality (Alpha Acid %, Beta Acid %, and Cohumulone %) for each of the six varieties to be assessed between each of the farms for year 1. 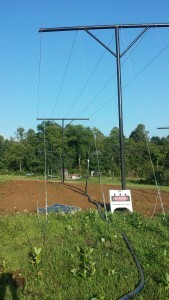 All three farms had erected trellis systems and planted rhizomes by mid-June of 2015 (Heartland Hops (Andy Pax), Fort Recovery, Ohio and Hop ‘n’ Pepper Farms, LLC (Steve Patterson), Athens, Ohio pictured). Bines were harvested in October and hop yards were mulched over for the Winter. Andy Pax will be presenting a study update at the Ohio Hop & Craft Brewers Annual Conference held Febuary 25-26 in Wooster, Ohio at the OSU/OARDC. Research results will also be presented at the OSU Extension Hops field Days held throughout the state in the summer of 2016.